Tuesday, September 4th, Benny woke up at 7:30 am, made his bed and took a shower. Then he had macaroni and cheese for breakfast with Thia. After breakfast, Benny grabbed his old back pack and got in the car. Gus thought it will be better if we keep Benny's new transformer back pack and lunch box until his birthday. At 8:35 am Thia and I took him to his school at Playmates, in Sandown. "Yay ... I am going to kindergarten!" shouted Benny excitedly. "Did you have fun at school, Benny?" "What did you do at school?" I asked him again. "Umm ... I forget!" Benny said, the usual answer. "What about the pin on your shirt, was that your school project?" I tried to remind him. "O, yes, I made this at school, do you like it, Ibu?" he asked me curiously. 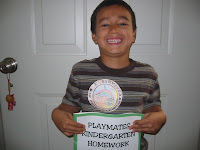 I giggled when I read the sign on the pin: "I survived the first day of kindergarten." "I love it! Good job Benny!" I said proudly. Benny's teacher, Mrs. Dooley gave the students some homework for September. I asked Benny to do one homework assignment after he had lunch. But after he did one assignment, he wanted to do another one. And after the second one was done, he still wanted more. He said, "I love homework!" " Homework is easy!" I laughed and said "Good Benny, keep it that way, I am so proud of you!" Then he went to ride his bike.